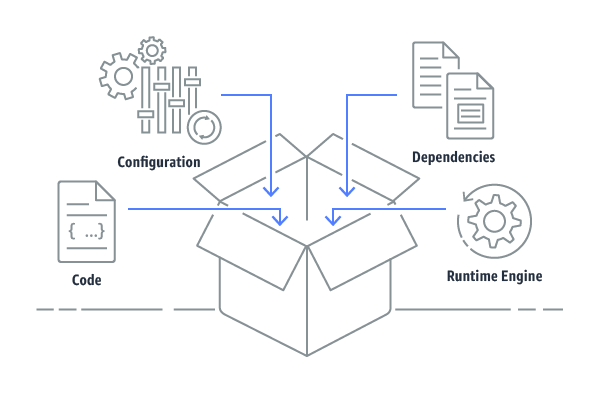 Containers provide a standard way to package your application's code, configurations, and dependencies into a single object. Containers share an operating system installed on the server and run as resource-isolated processes, ensuring quick, reliable, and consistent deployments, regardless of environment. The AWS Cloud offers infrastructure resources optimized for running containers, as well as a set of orchestration services that make it easy for you to build and run containerized applications in production. AWS supports OCI compliant containers, including docker containers. Containers package your code with the configuration files and dependencies it needs to consistently run in any environment. Containers provide process isolation that lets you granularly set CPU and memory utilization for better use of compute resources. Each container runs as a separate process that shares the resources of the underlying operating system. This enables containers to start and stop quickly. Containers provide process isolation that makes it easy to break apart and run applications as independent components called microservices. Package batch processing and ETL jobs into containers to start jobs quickly and scale them dynamically in response to demand. Use containers to quickly scale machine learning models for training and inference and run them close to your data sources on any platform. Containers let you standardize how code is deployed, making it easy to build workflows for applications that run between on-premises and cloud environments. Containers make it easy to package entire applications and move them to the cloud without needing to make any code changes. Use containers to build platforms that remove the need for developers to manage infrastructure and standardize how your applications are deployed and managed. Learn more about running containers on AWS. Learn how to get started with containers on AWS.